You might have to say goodbye to your 15GB camera roll bonus, too. 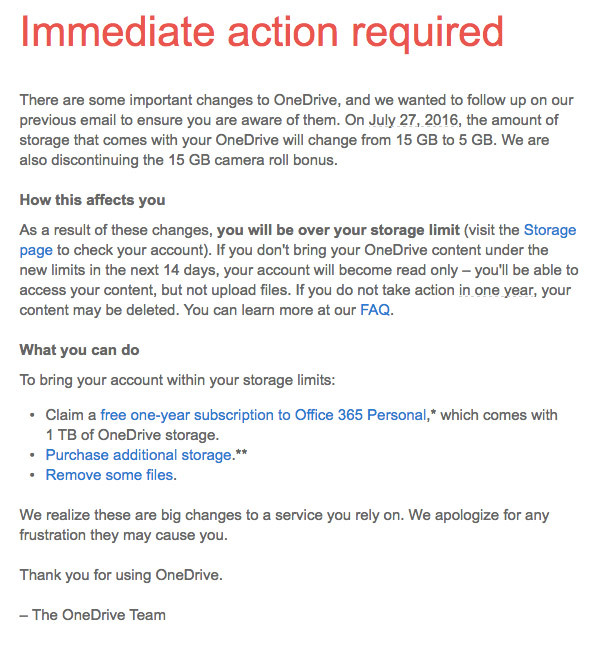 Heads up: if you didn't sign up to keep the 15GB worth of OneDrive storage Microsoft gave out in 2014, you'll soon see a big change in your account... if you haven't yet. Redmond is not only killing your 15GB camera roll back-up bonus, it's also slashing 10GB off your account, bringing it down to 5GB. The company started sending out emails about the change earlier this year, with a warning that your unpaid storage capacity would become even smaller than its original 7GB offering by either July 13th or July 27th. To be fair, Microsoft gave people a chance to keep their bigger storage and camera roll bonus by opting out of the July change. If you remember signing up for that before January 31st this year, there's no need to worry: you'll still get to enjoy both. But if you received an email like the one below, you may want to back up your photos ASAP. Sad, but you do have a lot of other options if you need a cloud service that offers a big free storage capacity. Google Drive, for one, will give you access to 15GB upon signing up.